Modifications: Only did about 6 rows for the ribbing for the arms and the button band. I started this hoodie with my friend Jillian as a knitalong. We both saw it out of the Fall Knitscene and I think I totally convinced her to make it all the while knowing she wasn't going to be too happy with the 200+ stitches she had to pick up for the button band. Sorry there Jill! We also kinda had to use the word "knitalong" loosely. I can't help myself sometimes, I get into a groove and then poouf it's blocking on the floor of my apartment. These hands have a mind of their own! Cascade Eco Wool really blocks out so nicely. This sweater has no shaping but I find that the cables gather it in just enough to give the illusion of shaping. EcoWool also has the tendency to grow lengthwise but I think in this case it's ok. I also happen to LOVE the over sized hood. When you have a pretty large head of hair it's hard to find a hood that won't fall back. This one has so much room I can let the curls fall where they may and feel assured my head will stay warm. 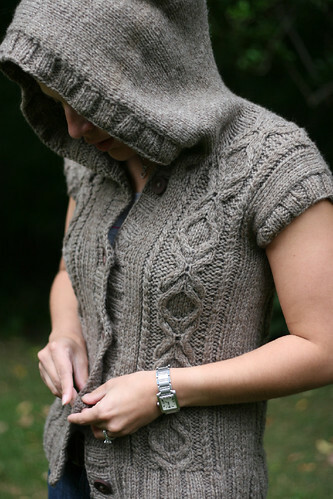 For those who aren't into such a huge hood, there are many people that dialed it back a bit by doing a few less rows. I got the buttons sewed right before the husband and I went off to an Oktoberfest party. Lederhosen, beer steins, wurst platters and a hand knitted sweater. Perfektion! That’s a lot of knitting young lady! Looks amazing!!! Love the slightly shorter sleeve, it’s a nice look. Great job. Another cute layering piece! Look awesome! Pretty, I might have to pick up that magazine now. very nice. I have my own in the works right now and can’t wait to get it done after seeing yours!! Thanks for the tip on the hood too. It ‘s beautiful, good job! Very lovely! Makes me want to add this to my queue! I really like this hoodie. It’s beautiful. At the same time, it looks so comfortable and practical. Great neutral color! I bet you will be wearing it a lot! I love this hoodie so much! Looks fantastic on you!! I was wondering how bulky this hoodie would look in real life. I love yours, quite a bit, actually. I have some Eco Wool…perhaps it wants to be a Heather Hoodie? I love the hoodie it looks wonderful on you. I’ve decided I must pick up this magazine thank you. Looks great! I saw the picture of the back and thought, oh, nice, it has shaping, and then read your comment underneath. Lol–the cables really DO make it look like it has shaping! Love! I saw it in the mag and was unsure, but I’d definitely knit one up now. it’s the only thing i like in the whole isse so i’m not sure whether to buy it..yours looks wonderful though!! good job. Love it! It looks so comfy and fall-like. love the jersey but unfortunately i cannot get hold of the pattern. would love to have this pattern in my collection any ideas where to find it in South Africa? You are definitely very talented! Awesome design!